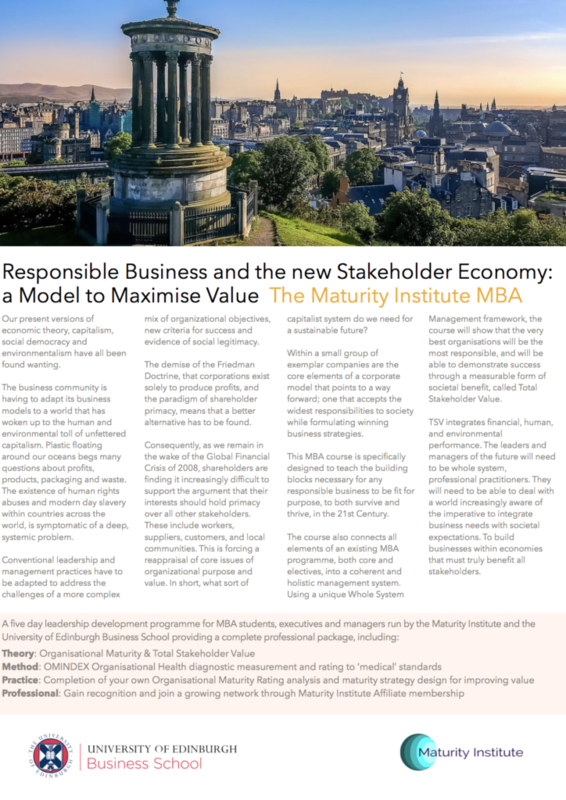 We are delighted to announce the launch of our new module for business schools ‘Responsible Business & the New Stakeholder Economy’. This course is designed to enable business school teaching to make the necessary transition towards the Total Stakeholder Value economy. It delivers new insights, perspectives and actionable steps by which organisations can generate the very best outcomes in human, environmental and financial terms. Our groundbreaking module provides a foundational programme in whole system management and the measurement of Total Stakeholder Value. It provides the necessary glue for multi-disciplinary approaches, unifying the disciplines of business strategy, finance, accounting, leadership, sustainability and human management systems analysis. This course can be completed as an MBA option, elective, or as part of a masters programme. It can also be completed as a standalone module to complement and enhance existing MBA qualifications and other management development programmes. It is constructed from MI’s core text – ‘The Mature Corporation – A Model of Responsible Capitalism’ and the work of MI in practice across corporate, investment, and regulatory environments. A simple methodology for improving an organisation’s value; both intrinsic and market capitalisation. The course also provides an immediate and quick route to Affiliate membership of the Maturity Institute (AMI designation) with further opportunities to progress to full, professional accreditation.